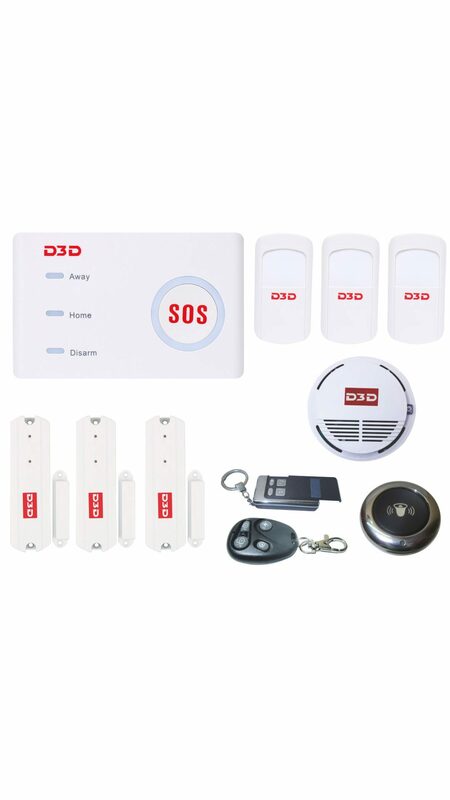 D3D D10 Wi-Fi/GSM Alarm System is an advanced smart home security system for home, shop, offices and business etc. Wi-Fi and GSM dual communication for reliable and stable performance. System sends notifications and all functions controlled on Mobile application via Wi-Fi internet connection. In case of Wi-Fi unavailable, system will send alerts and notifications via GSM SMS message. Include Wireless Doorbell. Never miss a visitor. Whenever doorbell press, System sends alerts on mobile application & inbuilt chime sounds on control unit. Inbuilt Smart home automation function. Control home lights, electric appliances etc. via smart switch Fully function iOS and Android mobile application. Easy system setup via mobile application. Zone name configuration so that user can know the alarm place and zone when receive the alarm notification and alerts Built-in high capacity rechargeable backup battery. System sends alerts on mobile app when sensor or system battery is low. Pet immune sensor to prevent false alarm. Temper switch to alert user if someone try to damage system Two way audio communication for monitoring and chat with family members. Support time scheduling for automatic arm or disarm Support all type of sensors i.e. Fire, Gas, PIR, Motion, Vibration, panic button etc. Step by step installation video and detailed user manual for easy home installation. 1 Year warranty and dedicated customer support team.